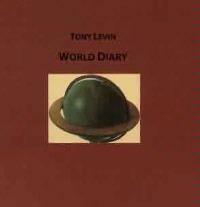 Tony Levin-World Diary is available for purchase directly from Papa Bear Records. The price is $15.00 and $2.50 for shipping and handling. To order from Papa Bear Records, write to Papa Bear Records, P.O. Box 498, Woodstock, NY, 12498. Be sure to visit their web page at http://www.papabear.com , to get a copy of the online order form or call 1-800-688-2227 to order by phone. The bass end of the stick starts this one out and sets the tone for this nicely moody piece. This number features Tony Levin and Shankar and, although mostly a textural piece, contains some nice melodic work and interesting changes. Featuring Ayub Ogada on Nyatiti (an 8 string lyre type instrument of W. Kenya) and vocals and Tony Levin on bass with funk fingers and harmony vocals, the mood here is that of a joyous African sort of texture. This is a fun, toe tapping sort of number with a wonderfully quirky bass line. A remarkably beautiful and intricate piece with some minor Asian sorts of textures at times, the sound here takes on modern jazz and Crimsonesque textures. This composition is very dynamic, alternating between musical styles and melodic and rhythmic modes. The musicians on this one are Brian Yamakoshi on Koto (ancient string instrument with silk strings and moveable bridge), Jerry Morotta and Tony Levin. A moody saxophone starts this track, but when the stick jumps in, the tempo and texture change dramatically, taking on some definite King Crimson influences. Bendik (tenor sax) and Tony Levin (stick) are the personnel on this one. Fairly frantic stick work begins this piece which features Bill Bruford and Tony Levin. The number eventually drops into a modern King Crimson sort of mode. This composition features a nice false ending, before going back into the frantic stick mode. Bill Bruford drops his drumsticks to signify the end of the song. This song has a very ominous, prehistoric kind of feel to the early sections. One can picture huge beasts lumbering around the primordial jungle. After a time the mode shifts into a high-energy rocker with lots of class. The musicians on this piece are Nexus and Tony Levin. According to the liner notes, "First sound on the track is T.L.`s Gaggia Expresso machine, the last sound is John Wyre`s nail sculpture. This is the short version of the piece, the full being too long for the CD." Featuring Levon Minassian on Doudouk (Armenian double reed instrument mad of wood from the apricot tree) and Tony Levin, Mingled Roots is a moody and quite exotic textural piece. Ayub Ogada and Tony Levin perform this piece which is another fun song in that joyous African tribal mode that we experienced in The Train. This is a wonderful duet between Bill Bruford and Tony Levin. Much of the song is in a sort of airy whimsical mode and is based on the types of joint solos that Bruford and Levin did on the Anderson, Bruford, Wakeman and Howe tour. The track does contain a section which is in more powerful and substantial textures, as well, though. The musicians on this track are Levon Minassian, Manu Katche, and Tony Levin. A considerably dramatic bass texture sets the tone for this piece, a sort of late `60`s power trio feel, ala Cream (although with quite different instrumentation). Eventually, the piece breaks into near chaos, as the strands of cohesiveness seem to become more relaxed. This looser/chaotic feel makes up the mid-section of the song, and the number eventually moves back towards the main impetus. Nexus and Tony Levin create an intro which is sedate and textural, but not to the point of being overly comfortable. Then a bass drone kicks in, driving the piece into new ground. This is quite a unique composition. The sax brings a moody jazz sort of feel to the intro to this piece. In fact, one can picture a small, smoky club. Eventually, stick begins to take control of the piece to a large extent. This piece covers lots of musical ground and contains many wonderful melodic moments. The musicians on the track are Bendik, Jerry Morotta and Tony Levin. This piece, which is a fairly sedate and pretty textural number, really flows quite well. Both Brian Yamakoshi and Tony Levin put in solid performances.